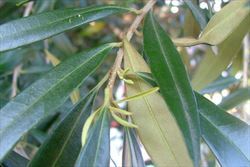 African olive (Olea europaea subsp. cuspidata) is native to Africa (i.e. Egypt, Eritrea, Ethiopia, Somalia, Sudan, Kenya, Tanzania, Uganda, Burundi, Rwanda, Zaire, Angola, Malawi, Mozambique, Zambia, Zimbabwe, Botswana, Lesotho, Namibia, South Africa and Swaziland), Madagascar, the Mascarenes (i.e. Mauritius and La Reunion), western Asia (i.e. Oman, Saudi Arabia, Yemen, Afghanistan and Iran), the Indian sub-continent (i.e. northern India, Nepal and Pakistan) and western China. 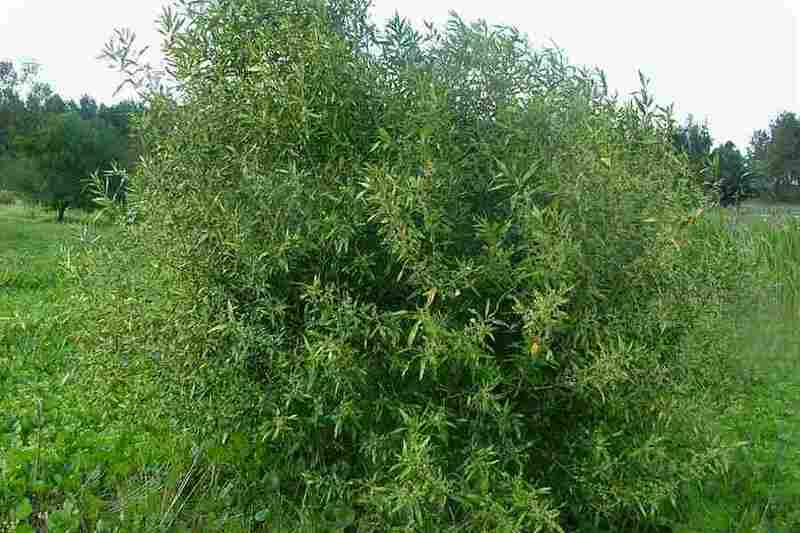 Cultivated as a garden ornamental, but also grown commercially for its fruit and for the production of olive oil. Widely naturalised in eastern Australia (i.e. in the coastal and sub-coastal districts of eastern New South Wales). Also naturalised in south-eastern South Australia and on Norfolk Island. A weed of warmer temperate and semi-arid regions, particularly those with a Mediterranean type climate. It becomes naturalised in open woodlands, parks, lowland grasslands, waste areas and along roadsides and waterways. An evergreen tree usually growing 2-10 m tall, but occasionally reaching up to 15 m in height. an evergreen tree usually growing 2-10 m tall with much-branched upright stems. its oppositely arranged leaves are elongated in shape (6-10 cm long and 1-4 cm wide) and often with hooked tips. 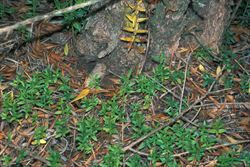 these leaves have glossy dark green upper surfaces and greenish or yellowish-brown lower surfaces. its small creamy-white flowers have four petals that are joined into a very short tube at the base. its purplish-black oval-shaped fruit (15-30 mm long and 6-20 mm wide) contain a single hard seed (10-15 mm long) surrounded by oily flesh. The much-branched stems are greenish-black to silvery-green in colour and mostly held upright (i.e. erect). 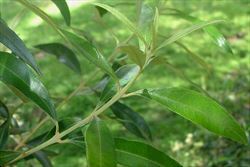 Older stems have a rough bark that is light or dark grey in colour, while younger stems are smooth or slightly ribbed. The leaves are oppositely arranged with entire margins, that are often turned under (i.e. recurved). They are elongated in shape (6-10 cm long and 1-4 cm wide) and usually have hooked tips. 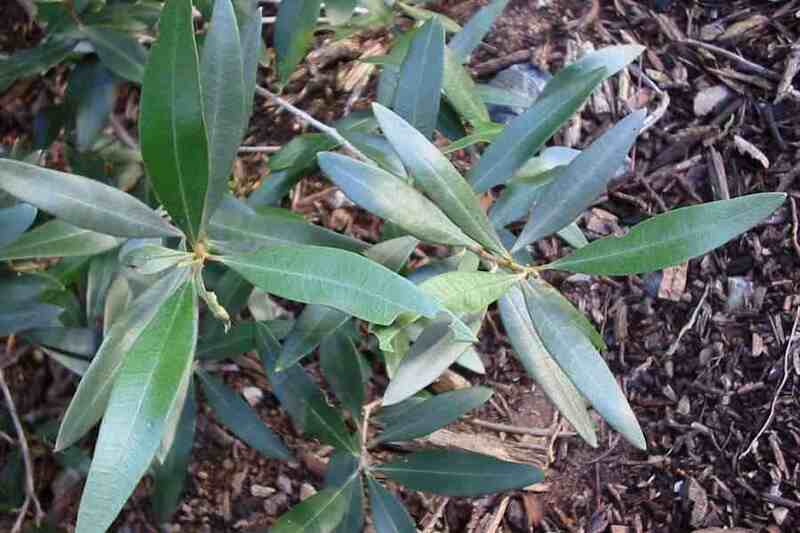 These leaves also have glossy dark green upper surfaces and greenish or yellowish-brown coloured lower surfaces. 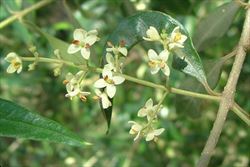 The flowers are borne in small clusters at the ends of the branches or in the leaf forks (i.e. axils). They are creamy white in colour with four small petals joined into a very short tube (i.e. corolla tube) at the base (about 1-2 mm long) with lobes about 3 mm long. Flowering occurs mostly during spring. The distinctive oval fruit (i.e. ellipsoid drupes) are green when immature and turn purplish-black in colour as they mature. These fruit (15-30 mm long and 6-20 mm wide) have a single 'stone' in the centre surrounded by oily flesh. The 'stone' is a hard brown seed that is oblong in shape (10-15 mm long). This species reproduces mainly by seed, however it also produces suckers after plants are damaged. Seeds are most commonly dispersed when the fruit are eaten by birds and other animals (e.g. foxes). 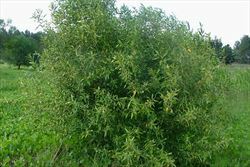 African olive (Olea europaea subsp. 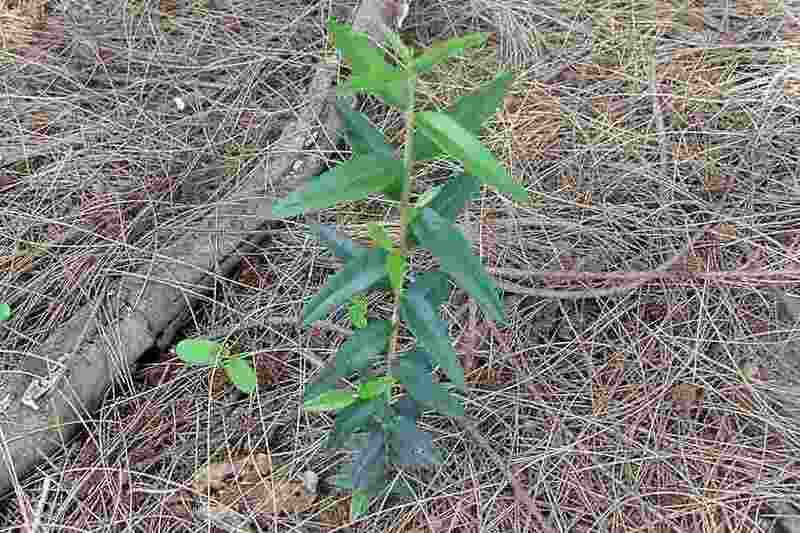 cuspidata) is regarded as a significant environmental weed in New South Wales and on Norfolk Island. It was recently also listed as a priority environmental weed in at least one Natural Resource Management region. New South Wales: Class 4 - a locally controlled weed. The growth and spread of this species must be controlled according to the measures specified in a management plan published by the local control authority and the plant may not be sold, propagated or knowingly distributed (in the Ryde local authority area only). South Australia: 5@ - this species is declared under Class 5, a category for non-agricultural weeds. Its presence must be notified and the plant must be controlled (throughout the entire state). 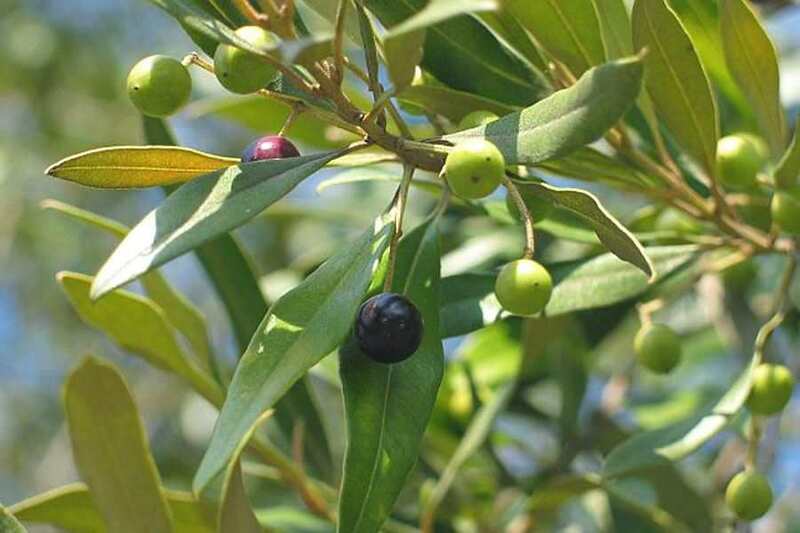 This declaration excludes olive trees planted and maintained for domestic or commercial use. the African olive page on the South Coast Weeds website at http://www.esc.nsw.gov.au/Weeds/index.asp. 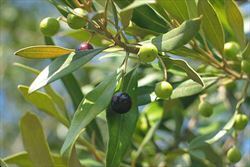 African olive (Olea europaea subsp. 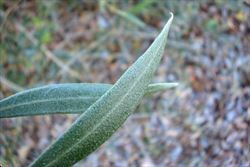 cuspidata) has leaves with pale greenish-brown undersides and prominently hooked tips. common olive (Olea europaea subsp. europaea) has leaves with silvery-grey undersides and pointed tips. 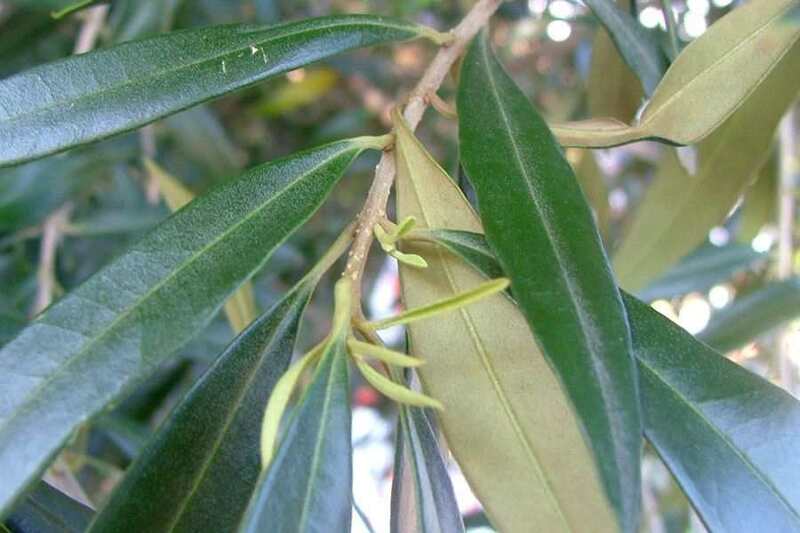 olives (Olea europaea) have oppositely arranged simple leaves. Their flowers have a short tube at the base and separate into four petals and their fleshy fruit are relatively large (15-30 mm long) with hard centres. 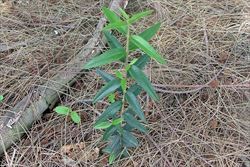 Australian olive (Olea paniculata) has oppositely arranged simple leaves. Its flowers have a short tube at the base and separate into four petals and its fleshy fruit are relatively small (about 10 mm long) with hard centres. 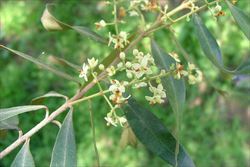 the mock olives (Notelaea spp.) have oppositely arranged simple leaves. Its flowers have four entirely separate petals that are not joined together and its fleshy fruit are relatively small (5-20 mm long) with hard centres. 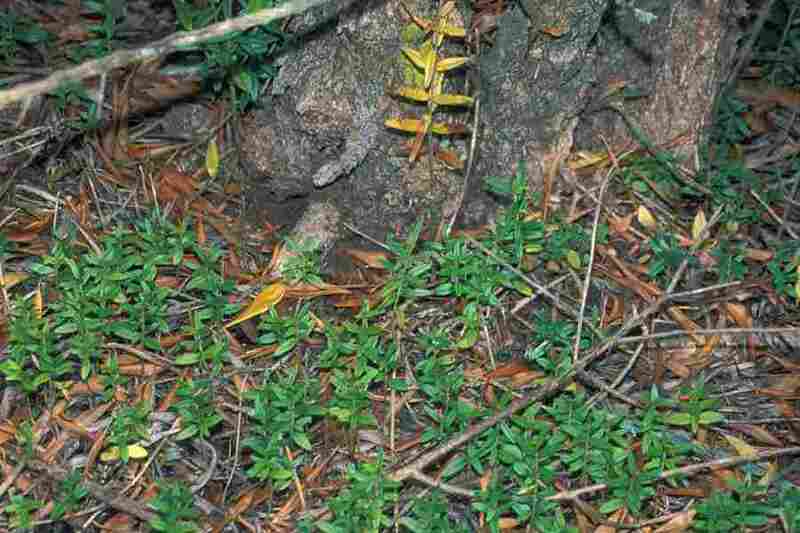 boonaree (Alectryon oleifolius) has alternately arranged compound (i.e. pinnate) leaves. Its flowers usually have five tiny petals and its fruit are dry capsules. This fact sheet has been updated thanks to the sponsorship of Sunshine Coast Council.